Few JRPGs have quite captured hearts and minds like Chrono Trigger. Of course, ever since its slightly bizarre PlayStation sequel, all we’ve seen out of the franchise is ports and slight remakes. That’s not to say the director and scenario writer for Chrono Trigger, Takashi Tokita, has been resting on his laurels, though. Since those days he’s helped with various Square Enix projects, and he’s played a major part in writing and designing the Final Fantasy Dimensions mobile games in particular. 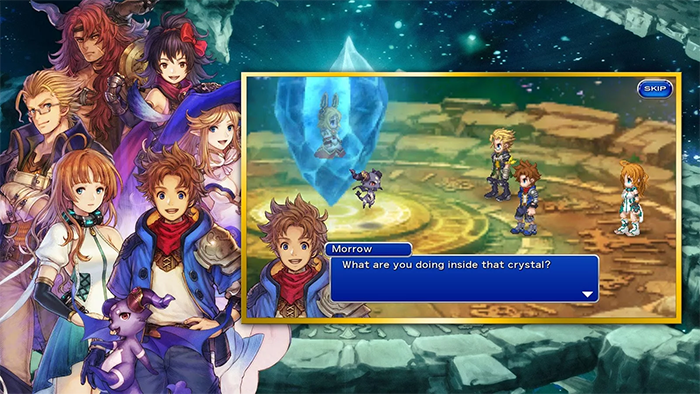 In some ways the connections aren’t too surprising, Final Fantasy Dimensions II focuses on time travel after all, but this will surely disappoint the Chrono fans who have been waiting decades for a fully fledged follow-up. If you’re willing to check out Dimensions II regardless, you can purchase the full game via the iOS and Google Play stores. Always excited to see something a little bit different, Tom is ready to report on games of all shapes and sizes, whether they be wonderful or weird (or, better yet, both.) Rest assured, if Nintendo ever announces Elite Beat Agents 2, he’ll be there.